You can take this white LED-based night lamp on your picnic outings. The lamp has sound trigger and push-to-on facilities and gives ample light during a walk at night. It will also prove useful in locating the door of your tent in the darkness. A click of the fingers will switch on the lamp for three minutes to help you in a strange place. The circuit uses low-power ICs to save the battery power. JFET op-amp TL071 (IC1) amplifies the sound picked up by the condenser microphone. Resistor R1 and low-value capacitor C1 (0.22µF) make the amplifier insensitive to very low-frequency sounds, eliminating the chance of false triggering. VR1 is used to adjust the sensitivity of the microphone and VR2 adjusts the gain of IC1. The amplified output from IC1 is coupled to trigger pin 2 of IC2, which is a monostable multivibrator built around low-power CMOS timer IC 7555. Resistor R4 keeps trigger input pin 2 of the monostable normally high in the absence of the trigger input. Timing elements R6 and C4 give a time delay of three minutes. Reset pin 4 of IC2 is connected to the positive rail through R5 and to the negative rail through C2 to provide power-on-reset function. 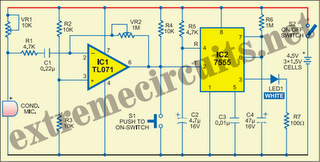 The output of IC2 powers the white LED (LED1) through ballast resistor R7. The circuit can be easily assembled on a perforated board. Make the circuit assembly as compact as possible to enclose in a small case. Use three 1.5V pen-light cells to power the circuit. Adjust VR1 and VR2 suitably to get sufficient sensitivity of IC1. Toggle switch S1 can be used to switch on the lamp like a torch.